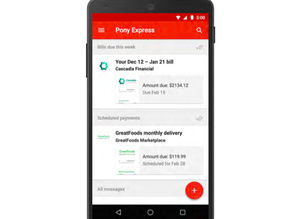 Google is reportedly working on 'Pony Express,' a new feature for Gmail that will allow users to receive and pay their bills without leaving their email inbox. Internally, the company is calling the service "the future of paper mail" and it could roll out before the Q4 this year. How does the service work? Reports say users will need to provide lots of personal information about themselves, including full social security numbers, and their identities will be verified by a third-party. Once that is completed, you will be able to receive bills right to your inbox (Gmail or Inbox), and pay them, as well. It appears you will be able to pay via credit/debit card and also link up a bank account. Finally, Pony Express allows you to forward bills to others to split the balance, for example if you live with roommates and they help split that electricity or cable bill. That is not that useful considering most banks allow you to set up auto-payment, even smaller ones. I use auto-payment for all my accounts that have it, and for the ones that do not, I do not really want another service to handle the payment. I have just about all of my bills on auto pay so not sure this will help with them. But I could see this being nice for some people. I also could see this being nice for new services before I decide if I am going to keep them long term. What a pointless service. Most banks do allow auto pay plus most service providers give the same service for automatic draft and electronic billing. Those who want to make payments electronically or get their bills online are already doing so.